First things first, was honing in on the style that they were going for in the space. They had purchased the biggest piece (a beautiful grey couch) and now needed all of the other pieces brought in. I started by putting together three Pinterest boards to help visualize options - Classic, Eclectic, Neutral styles that could easily go with the grey couch. We decided that a classic look of blues and grays was going to be the route we would take for the space. Seasonally, we could pull in other themes, like florals in the spring, or holiday pillows in December, but this semi-neutral pallette would be a constant throughout the year. I began searching for the biggest pieces, an 8X10 rug and a tufted ottoman. We wanted to be cost conscious as we all knew that with two littles and a pup running around, these items would likely be seeing a lot of action. After looking high and low online, I decided to stop by a store I'd always wondered about, AtHome. This is a little slice of home decor paradise - you absolutely have to go in with a plan in mind of what you are looking for, because the choices and options are ENDLESS. We sourced the perfect 8x10 rug for just $99.99. AtHome for the WIN - an 8x10 rug for $99.99 is unheard of (and perfect for a busy family of four at this stage in the game). We loved the look of a tufted ottoman and found some great options, deciding on this beauty by Safavieh. It was on backorder from several online retailers and we ended up finding it in stock (and for a bit less) through Home Depot. This classic tufted ottoman adds a pop-of color to our neutral family room. 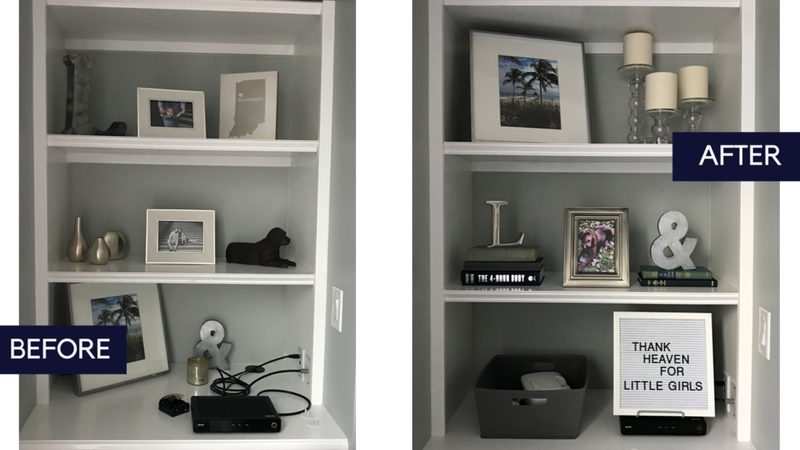 Now onto the accent pieces, a gallery wall, styling the bookshelves and finding a perfect little tray to hold items on the ottoman. Trips to Ikea, At Home, Home Goods, Goodwill and Target allowed us to find the perfect pieces (along with shopping my client's home for items that could be repurposed in this space). Check out the beautiful transformation that took place just in time for entertaining this holiday season! I'm so thankful I had the opportunity to work on this project!! And just in case you were wondering, we spent a total of $889 on this room (excluding the cost of the couch and arm chair that was brought in from another space in the house). Happy pocketbook, happy family, happy space.